WAFR and WVSP were no ordinary radio stations. Amid a media landscape that was overwhelmingly commercial, both stations were non-commercial. They depended on neither advertising revenue nor funding from any established institution like a college or university. Raising the funds needed for a non-commercial broadcasting was far from easy, however. These stations survived for years on a mix of modest federal funding, grants, and listener donations from regular fundraising campaigns. But WAFR and WVSP both eventually folded largely due to the overwhelming and constant challenges of raising adequate funds for maintaining station operations. 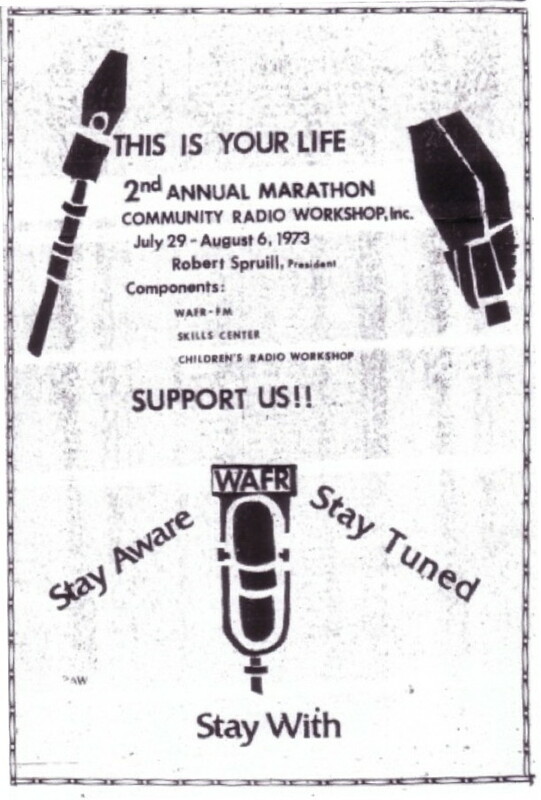 But as long as they were on the air, both stations never let their audiences forget that they were listening to non-commercial radio, as the audio clip from WAFR’s 1975 fundraising marathon demonstrates. WAFR and WVSP embodied a participatory vision of media based in local communities. At both stations, volunteers without any prior experience in media could complete the necessary FCC-mandated training that allowed them to host their own shows on the air. 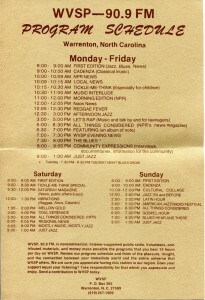 Volunteers accounted for a large majority of broadcasting hours at both stations. 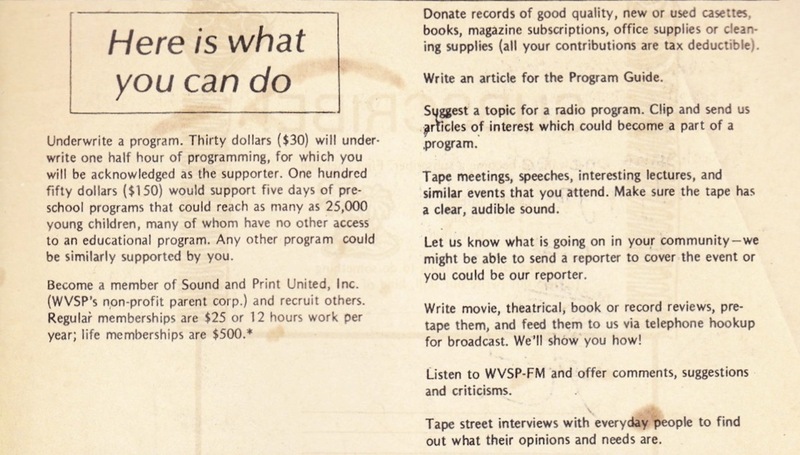 The excerpt below from the April 1978 issue WVSP’s Dialogue invites listeners not only to underwrite programming, but to share recordings of meetings and lectures and even submit audio interviews of people on the street to the station, all to be played over the air. Yomi Moses, a Nigerian student at North Carolina Central University, leads children in singing their ABCs at a meeting of the Community Radio Workshop. Moses also gave lessons in his native Yoruban language at the CRW. When WVSP started broadcasting several years later in Warrenton, its staff members also made international news, especially reporting on Africa, mainstays of their programming. The station developed close ties with Durham’s Africa News Service, the U.S.’s first wire service devoted to news from the African continent (more on this in a future post), and became one of its most loyal distribution outlets. Interestingly, the station’s tenure between 1976 and 1986 coincided neatly with the Soweto Uprising and the ultimate passage of the Comprehensive Anti-Apartheid Act of the U.S. Congress. Consequently, WVSP frequently featured reporting on the international movement against apartheid that gained unprecedented momentum in these years, both on the air and in its newsletter, Dialogue. 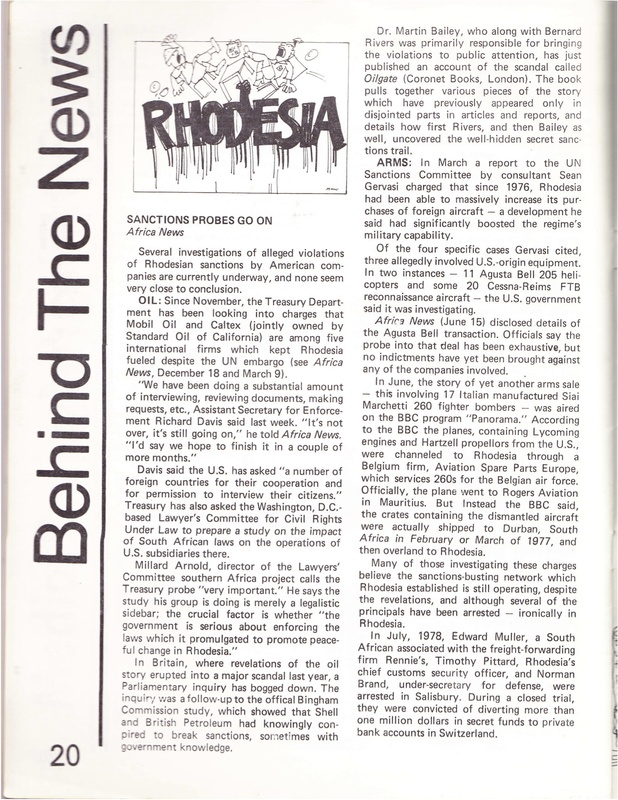 A WVSP Dialogue story from 1978, provided by Africa News Service, on U.S. corporations that potentially violated a trade embargo with Rhodesia and also dealt with South African firms. reported on music, politics, and station happenings. In 1976, Valeria and Jim Lee founded WVSP, a non-commercial radio station that broadcast from the small town of Warrenton, North Carolina, about one hour north of Durham on Interstate 85. Prior to founding the station, the Lees had already done extensive work with North Carolina activist organizations ranging from Malcolm X Liberation University, to Floyd McKissick’s Soul City, to their own rural empowerment program, Andamule. 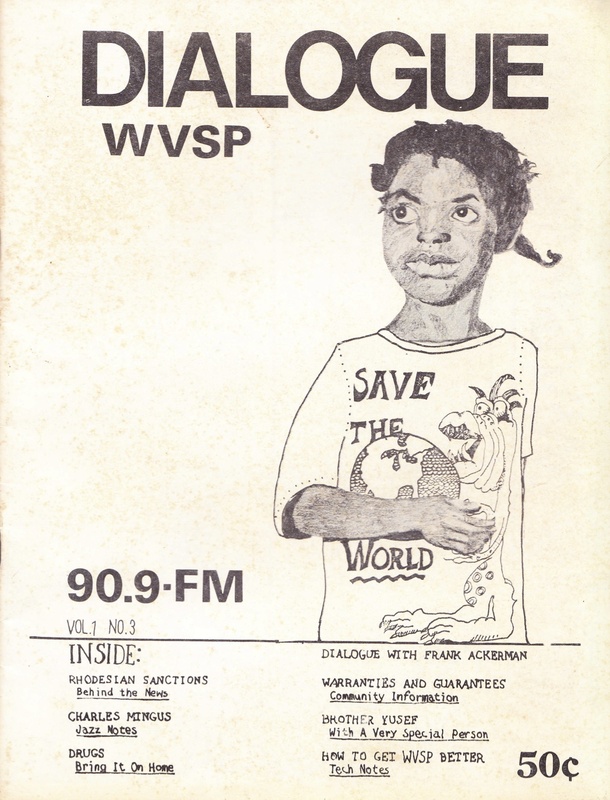 From 1976 until WVSP’s closing in 1986, however, the Lees focused their energies on using radio as a tool for political and cultural empowerment in rural northeastern North Carolina. 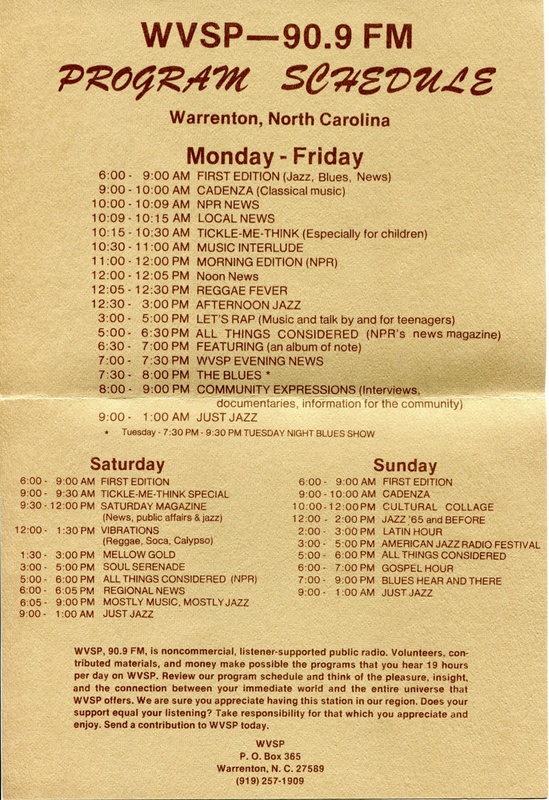 As Valeria explained in a 2007 interview with SOHP staffer Aidan Smith, she and Jim launched WVSP as a vehicle for “community development…[and] justice work.” The station devoted its programming to progressive reporting on political and social issues and a wide range of musics, most prominently African American genres like jazz and blues, which rarely received airtime on commercial radio in the 1970s and 1980s South. In addition, WVSP embraced a thoroughly democratic approach to programming by giving any local volunteers willing to put in the requisite time and work the chance to host their own programs. In the following audio excerpt, longtime WVSP staffer and music director Jereann King Johnson introduces Tickle Me Think, a children’s educational show, in an episode focusing on folk songs.